Unwrapping more prints. 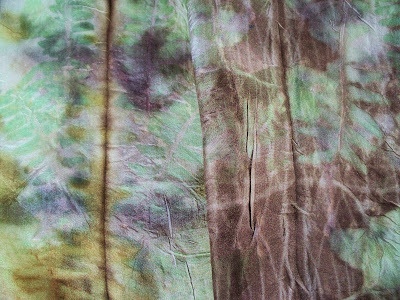 This one done on silk chiffon with oak leaves, philodendron spathes and a little madder extract. Wrapped it around a can that rusted and threw in a few onion skins into the bath. The next picture shows both ends of the scarf. This is my favorite so far. Then I tried for a lighter colored silk habatoi scarf. This one had fresh fern, Turk’s Cap leaves and tradescantia pendula leaves (also known as Wandering Jew). It presents a very delicate image. More coming out of the pots in a few days. I will say this is very addictive. 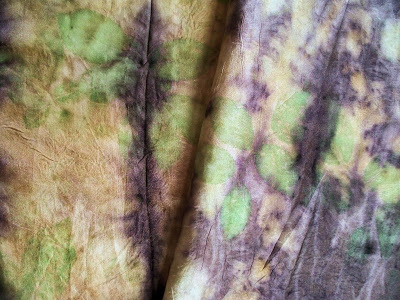 It’s so much fun to see how various plants and dye bath combinations turn out.